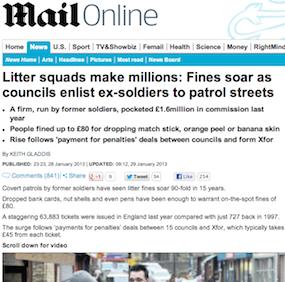 A local resident (who insists she is not a Daily Mail reader) poses the question as to whether the sort of litter squad highlighted in this story is a good idea or not. It’s an interesting question, because lots of people would like to see stronger enforcement of measures against litter louts or those who allow their dogs to foul the pavements for instance, but how many would be concerned about the civil liberties aspects, the big brother state and heavy-handed enforcement. As councillors we are all too aware of both aspects; we get complaints about parking issues both in terms of inconsiderate parkers, and get it in the neck from those who feel the fines are unfair. It is all a question of balance I suppose. What do other people think? At Cleaner Northfield, we welcome any attempt to combat litter. And we certainly don’t see the freedom to drop litter as a civil liberty. Surely the vast majority of people would support the right to clean streets. We trade at Sutton Coldfield Farmer’s Market. On the Sutton ‘Parade’ there is an active ‘enforcement team’. Two heavily built guys both wearing plain clothes are very active in aggressively handing out fines to those who drop cigarette butts and other litter. Most offenders are grabbed and stood against a wall. Until ID is produced I think most of those being handed a fine believe they are being mugged! Like most people out there, I am not sure what to think! I hate litter and those people that litter really irritate me. I guess that myself and other traders that observe the litter ‘enforcement team’ are just left with a bad taste in the mouth at the prospect of these plain clothes teams stopping people in the street. Echoes of a secret police force perhaps? Do these teams act as a deterrent? The are not visible so are not a visual deterrent but perhaps people not knowing ‘if they are watching’ is more of a deterrent? Not sure! Great idea, people don’t care and alot won’t change without consequence. I agree it is about balance, but I don’t know whether I would rather have litter than some paramilitary style litter police lurking on every corner. Well Stephen, perhaps you don’t have to clean the carpet and scrape the dog**** off the kids buggy and shoes twice a day after walking up Abbey Road to the school. Paramilitaries? Yes, please!!!! Its simply take your litter home or find a bin, what’s so hard about that? if not pay a fine! The amount of car drivers who open their windows and throw out rubbish just infuriates me, the same when people just drop litter a few feet from a bin…. The report says people were fines for dropping orange peel, & banana skins, well I think they should be a bit of wet weather and these can become dangerous. Maybe a campaign to raise awareness that the area will become a no litter zone and a few weeks of polite warning before the tickets start being issued could help? Totally agree about the car rubbish throwers. Drives me insane. I think some of the examples in the Daily Mail article are deliberately chosen because they sound ridiculous, but you don’t know the whole picture. Personally I’ve no problem with genuine litter throwers being fined, in so many ways it is much more offensive than parking on a double yellow line or being 10 minutes late on your parking ticket, so why not. I don’t see how anybody can object to keeping their neighbourhood clean and safe. This is an issue of people taking responsibility for their actions and he impact they have on our environment and our neighbours. If people don’t drop litter of let their dog(s) cr*p on our streets they would have nothing to fear from enforcement police/patrols. I would happily support a transfer of resources from patrolling parking (which is a money making scheme) to policing littering, dog fouling and similar anti social behaviours. Hear! Hear! Well said!…if people did NOT litter and let their dogs cr*p every where then there would be no need for ‘Litter Police’ …… I rest my case M’Lud….Bang em up and throw away the key as they are NOT people I wish to consort with in MY Community!!!!! There’s certainly a lot of anger out there in respect of litter (and dog poo, of course). I’m not at all keen on paramilitary-type action on litterbugs. I hate litter and dog poo as much as the next person, but lets keep a sense of proportion here. i certainly can’t agree that dropping litter is less henious than parking on a double yellow: tell that to the parent whose child has had a near miss outside school due to illegal parking by the school gates. In Bearwood, the council does a good job of clearing up the litter which, I am sorry to say, will always be with us even if you bring in the death penalty for dropping it as I suspect some residents might like to do! At the end of the day there are more important things to worry about – like the homeless man who died in a churchyard in Bearwood under our very noses, for example. Facebook? What’s that then? The authorities’ attitude towards the homeless is getting harder in Bearwood – just at a time when we have more homeless people sleeping on the streets. It is a growing problem, and with respect, far more serious than litter or dog poo. How typical is parking on yellow lines outside schools? Just visit any of Bearwood’s schools between 8.30am and 9am and you’ll see that it is highly typical. It was Bob who brought up parking, not me, so I don’t see how that is going off topic! Whilst I think the thing about the homeless is a complete red herring (I note you don’t reply to the point Vicky made about what to do with those who refuse help) I would be interested to know which ‘authorities’ are taking a harder line on the homeless and what evidence you have to support that. I don’t understand why you don’t think priorities could be changed in terms of enforcement but include at least maintaining the existing level of enforcement around schools. You are obviously content with the amount of litter in Bearwood. I’m not, and from the feedback I get, neither are a lot of other people because in all surveys littering and dog mess top the list of concerns – although I suspect you are not the only person who thinks that letting people die in the street shouldn’t happen either. Ha, ha, up to your old tricks again Bob! Ever the politician! You said ‘in so many ways [litter] is much more offensive than parking on a double yellow line’. Nothing about maintaining existing enforcement around schools, which is why I brought the subject of schools up. Instead of acknowledging that you hadn’t actually considered the case of schools when you made the original remark, you accuse me of ‘[not thinking] priorities could be changed in terms of enforcement ‘ – when I said nothing of the sort! And now apparently I am ‘content’ with the amount of litter and dog poo around Bearwood. Errr… did you actually read my comment which said: ‘ I hate litter and dog poo as much as the next person’? Evidently not. Lengthy reply, but still no reply to the question from Vicky about what we should do with the homeless who refuse assistance, nor my inquiry about who is being harder on the homeless in Bearwood, and how. Perhaps you should consider a career in politics! It isn’t a question of not having considered parking on double yellow lines by schools, but simply a matter of switching the emphasis to enable enforcement to continue in some areas. I don’t think you will find I said we should completely abandon parking enforcement, so I apologise if I didn’t provide you with a list of all those areas that we should prioritise. You did say you hated litter and dog poo, but then rather complacently said the Council did a good job of picking up the rubbish strewn around by litter louts, as if that made it ok. I agree, we do spend quite a lot dealing with littering and flytipping, but like most council tax payers, I would prefer my money to be spent on schools, street lighting, highways, care for the elderly and disabled, than having to clean up after inconsiderate swine who casually throw their fast food wrappers out of the car window. I have been following the comments with interest, but it does seem to be becoming a little fraught with tensions running high…. I do believe the original question was how do we feel about our local litter problems and how do we feel about dealing with it? Some of the above comments seem to have gone a little of track? Not fraught, Jenny, just a bit of banter. I agree about being a bit off the point though. Recently I filled two black bags within a 20 metre radius of my front door (though one bag was just from a house whose front wall has been removed and the remaining ditch now acts as great place for the blowing litter to gather) and within a couple of days it was all back again. I am to an extent willing to keep doing this as I cant bear to walk over it each day as I head out my front door and I dont want my children growing up thinking this is normal – but I shouldn’t have to. I have been thinking about how to get people to stop and who can help – perhaps other residents, and the school? but I havent a clue where to start. I dont know what I think about the squads but I do know that litter breeds litter – the broken windows theory. I agree that a good job is done cleaning the high street as I have seen it late at night and again the following morning and its been thoroughly cleaned but as Bob says it isn’t about how well the council clean up – its a deeper question about peoples attitude towards society and the places they live. That sounds great, many thanks for the offer. I would love to hear your thoughts on setting something up long term in particular as its in that area I havent a clue where to start…..
You sound like a fab lady, Sally. I love it that some people are thinking of solutions rather than just ranting. I’m afraid I’m too frequently in the rant brigade! Personally I think that leaving dog mess in the street is the worst kind of antisocial behaviour – it affect all of us & makes us walk around with our eyes fixed on the pavement rather than on other people. I also don’t like that my children accept it as normal with no clue that not everywhere is like this. I’m sure most dog owners pick up & I’m also sure that some wouldn’t whatever (I’ve seen dogs out without their owners …) but surely we can aim higher than 6 different lots of mess between my house & the school 4 mins walk away. Are there any dog owners out there who could tell me why mess is left & what would be a good motivation to pick it up?